Season - None All year around. Getting to Paloma Real lodge is easy. The ranch is located in centralá Argentina in the province of Cordoba, 50 miles (80 km) south of Cordoba City’s international airport. Driving time: 50 minutes. The best way to reach Cordoba from the US is going through Santiago, Chile with connecting flights to Cordoba City. There are also flights through Lima, Peru. Arriving at Cordoba’s International airport (either from the US or Europe) will allow you to be pigeon shooting that same day since the lodge is not far from the airport. Guests can also fly to Ezeiza International Airport in Buenos Aires, then transfer to the domestic airport and take the hour flight to Córdoba. 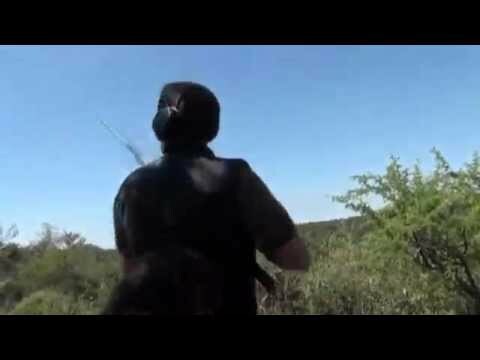 Cordoba is considered the pigeon shooting capital of the world. The 40 square mile radius (70 km) around the lodge is annually inhabited by over 6 million pigeons. The lodge features 40 shooting fields, which are within a 30 or 40-minute drive through rolling hills. Like pigeons worldwide, they offer fast and challenging shooting – the difference here is their monumental number. On a typical day, guests will shoot from 100 to 150 challenging pigeons. We meet in the morning for a delicious breakfast at 7:30 AM. After a short drive of 30 or 40 minutes, you will arrive in the shoot where you will be assigned a bird-boy. He will assist you with shells and drinks and anything you may need and one of our professional guides will be around ready to help you too. We take a break at midday to enjoy a wonderful lunch in the field: an incredible barbeque with the famous Argentine beef. Afternoon begins at around 2 or 2:30 hs., and continues until almost dark. When the shooting day is over, you will continue with cocktails and an early dinner at the lodge. The shooting fields are carefully rotated and rested to assure maximum bird number. This is part of our Game Management Program, which allows for a successful big-bag shooting season all year round.This is part of our Game Management Program, which allows for a successful big-bag shooting season all year round.